Without the generosity of our supporters, our ability to help out the dogs in need would be severely limited. Currently, our largest expenses are food and vet care, both of which vary depending on the number of dogs in rescue. Our greatest resource, and the hardest to come by, are knowledgeable foster homes. For these reasons, available resources at any given time dictate the number of dogs we can accept into foster care. We are fortunate to work with the people and companies on this page, as they support us in many ways. Donations of services &/or product, of any kind. Reduced prices on veterinary procedures. Donations of dog food help reduce our food bill. In-store promotions or special fundraisers. Donations of bedding, toys, crates and other accessories help provide comfortable sleeping spaces and hours of play. Donations of big ticket items - fencing material, small farm machinery - really help us stretch our food and vet budgets. Donations of time and expertise - taking photos, grooming, building fences, yard maintenance, handyman repairs - mean so much more than you will ever know. We would appreciate it if you would thank our supporters, either directly or by shopping at their place of business. By continuing to support these local businesses, you are indirectly supporting us. Many of the dogs enjoy the benefits of staying at the Retreat. Currently, the foster dogs stay here for the cost of dog food. 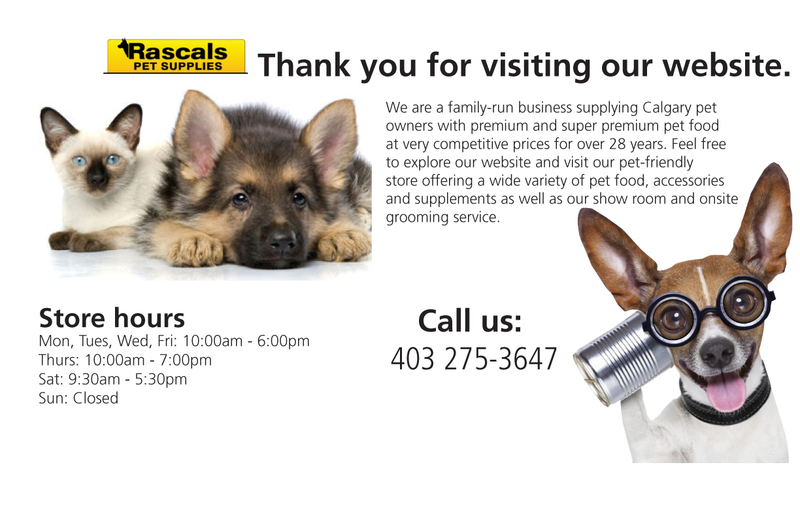 The folks at Rascals have been supplying our dog food & treats for over 20 years! If they don't have it in stock, they will bring it in. Not only do they bring in what we need but they collect & donate dog food to help stretch our dollar even further & they have done numerous in-store promotional campaigns in support of our dogs. Chris & Allison, of the Ranch Market Pet Planet in Strathmore, are recent additions to our list of supporters. The have been collecting & donating dog food on a regular basis, as well as supporting us through some in-store promotional campaigns (the Pound for Pound dog food campaign & the Buy 1, Get 1 Kong toy campaign ). We have to thank Puppy Love for their generous donation of assorted beef chews for our foster dogs. The dogs were doing just about anything to get one! The variety of sizes allowed us to give them out as treats or as a longer chew, although the dogs made short work of them, no matter what size. The dogs give these treats a thumbs up & would highly recommend them. As part of our dogs' healthy diet, we like to give them turkey necks on a fairly regular schedule. They love them as a treat & we like to give them as a good way to clean their teeth. We also like to give raw, meaty bones occasionally, to satisfy the need to chew, as well as a healthy meal replacement & teeth cleaner. Back to Basics is our source of raw goodies & we would recommend them if raw is your preference. Without the support and help from various vets and health practitioners across the province, we would not be able to help the number of dogs that we do and adoption costs would be much higher. We cannot thank them enough for their services. Stop & Go Reproductions designed this Agility Record Book for us and, to top it off, they very generously sponsored the cost of the first run of 100 books! That means 100% of the sale of each book goes directly to helping the dogs. The cost of each book is $10 (plus postage, if we cannot arrange local delivery). We have limited supplies left so please email us to order. The generous folks at Omega-Alpha donate E-Z Rest formula for those foster dogs that exhibit more than the usual anxiety and restlessness when kenneled. We also give it to those fosters that exhibit more than mild separation anxiety and to those dogs that stress in new situations or on car rides. The good folks at Especially for Pets offer a wide variety of unique pet products, daycare, grooming & training. Best of all, they are big supporters of local rescues! We were very grateful to be the beneficiaries of one of their fundraisers - Bump Up Your Bill - a neat idea to round up your purchase price over the month & then they matched the amount raised. We are very grateful to the many agility groups that have either donated directly, did a fundraising event at their agility trial or have donated entries or services to one of our fundraising auctions or raffles. Please check them out on our Agility Training page.